The Godfried family have been butchers in Meppel for decades. Samson Elias already had a butchery on the 2nd Hoofdstraat in 1850. His son Andries succeeded him; because of his small posture they called him ‘Aanseltien’. An impetuous little man, who regularly drank too much. When his son Izaak was old enough he succeeded his father in the butchery. Andries was a man who could not sit still; he helped his son Izaak in the butchery, which now had moved to Woldstraat. Izaak like his father was also an impetuous man. One day he had a quarrel with saddle maker Korten about the ownership of the entrance gate between Korten’s house and that of his father. When Korten told him that the gate belonged to him, Izaak went mad, ran inside, grabbed an axe and began chopping up the gate shouting ‘if that is the case, then I don’t want your gate attached to my house’. A few passers-by managed to grab the axe from Izaak and the incident ended quietly. My grandfather had a kosher butchery on Woldstraat. Once a week my grandmother would make a pan of soup from the left over meat. On Saturday she would go and visit the people who were sick and weak. Typical small-town narrow-mindedness: people gossiped about this,’the Godfrieds sell on Saturdays!’ The Rabbi heard this and took upon himself to interfere:’Izaak, do you sell on Saturday?’ Granddad, a pious man, became so angry about so much injustice, that he put the Rabbi out of the shop. Immediately he bought a pig and displayed it in the window. It was the end of the kosher butchery. Izaak never went to the synagogue any more. Izaak married Rachel Coster from Rotterdam. 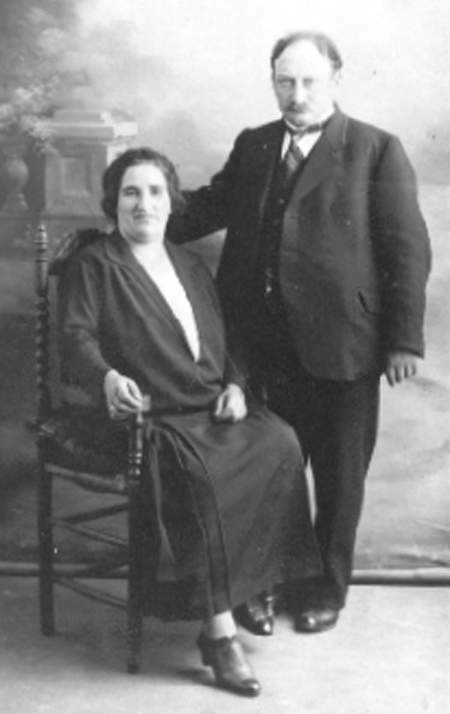 The couple had six children, Andries (1904), Jetje (1906), Bertha (1907), Jacob (1909), Sientje (1911) and Max (1916). It is not clear whether he wasn’t a good businessman, or that the crisis played a part. In 1925 Izaak went bankrupt and he closed the butchery in Woldstraat. The building was sold, after which he moved to Blankensteinweg. In 1930 he became a cattle trader and a wholesale meat merchant. Izaak died on 25 January 1938; his eldest son Andries succeeded him in the business. 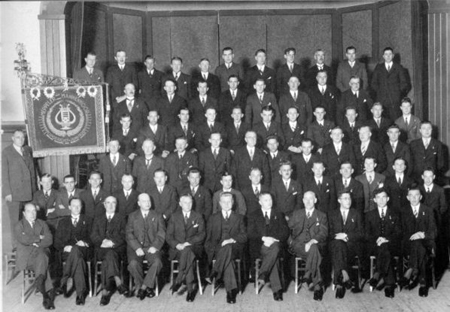 ‘Meppeler Mannenkoor’ (male choir) in Stern’s hall in the Hoofdstraat. The Godfried family home on Blankensteinweg. 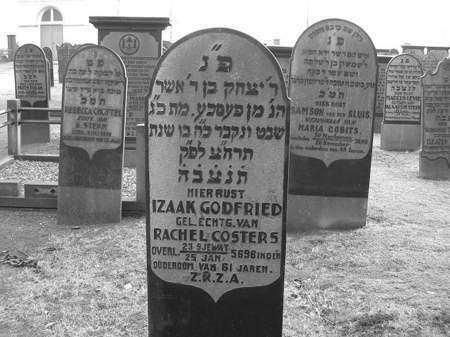 Izaak Godfried died long before the war and was buried at the Jewish cemetery on Steenwijkerstraatweg. How about the other five children? 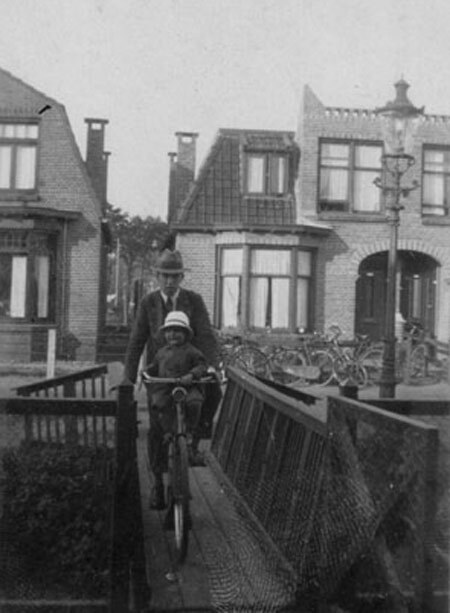 Sientje married Sam Lezer from Assen and moved to India (she had two children Leo and Rita), Bertha married in1936 to Aron de Groot and moved to Amsterdam. Jetje became a teacher at the Vledder school. 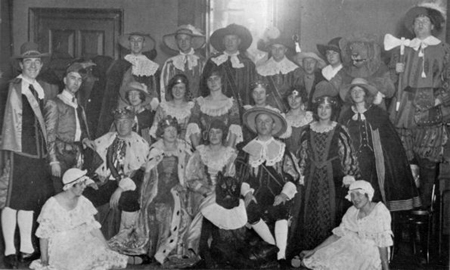 photograph of the ‘Gelaarsde kat’ (Puss-in- Boots) from 1929. 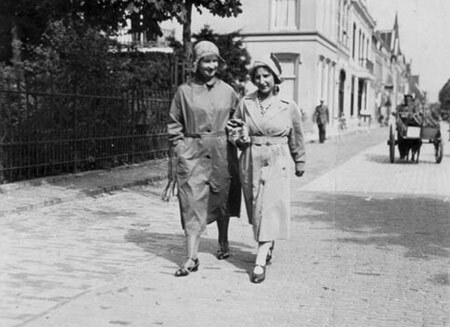 Jetje Godfried having a morning walk with a friend on Zuideinde. At the beginning of the war, Andries, Jacob and Max were still unmarried and lived at home (Blankensteinweg). They were all three butchers at the slaughter house on Galgenkampsweg. Max and Jacob were probably employed by their eldest brother. 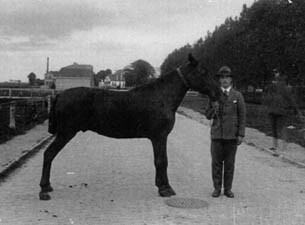 with a horse in front of a stable. During the war they did not have much luck with their work. Their boss was a Mr Visser: sympathising member of the NSB (Dutch National Socialist Movement). 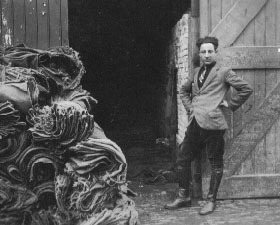 When it was impossible for Jews to be employed by the council, he referred to the fact that the slaughter house was a council department, and that the Godfried brothers were Jews. He then asked Mayor Wisman if the Godfried brothers could carry on with their work! The mayor asked Chief Inspector Breedveld to deal with this problem and asked him for advice and the latter’s answer was quite clear: the three Jewish butchers had to be dismissed, because the head of the Food and Consumer Product Safety Authority could have problems if they stayed. Breedveld and Wisman took measures which were not covered by any regulation and acted only in the interest of the head of this Consumer Product Safety Authority. The drama was complete on 17 August, when the three brothers had to take the bus, which took them from Meppel to the camp in Linde. They stayed there one day and were then transported to Westerbork. Max, Andries, and Jacob left on 24 August 1942, apparently as volunteers from Westerbork to Auschwitz. Had they been promised good prospects? Reality was different: Max died on 18 September that year, Andries and Jacob on 1 October. Why was Max killed two weeks before his brothers? Was it because he was a homosexual? That he died earlier, gives us the idea that in Auschwitz he got separate treatment and that he was probably separated from his brothers; not surprising, considering Nazi behaviour with respect to gays. Izaak died on 25 January 1938; his oldest son Andries succeeded him in the business. 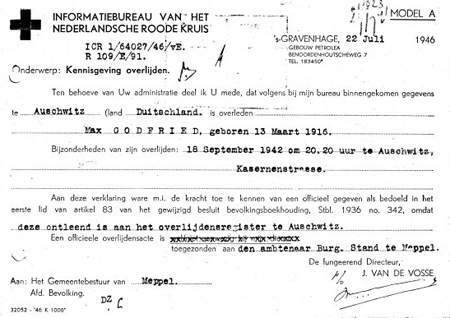 Max Godfried’s death certificate drawn up by the Red Cross. About the ‘departure’ of Rachel Godfried-Coster from Meppel more information is known. It is certain that in the night of 2 and 3 October, Rachel was taken by force out of her house by members of the municipal police. A possible reason for this was that Mrs Godfried being deaf and alone, did not hear the banging on the door. During all the commotion they forgot to turn the light off, so they had to return to the address the following night. 221/2 Information by telephone: that in the house of Godfried on Blankensteinweg the light was on. Spruit and I, the undersigned [Kroeskop, TR] entered the house via the flat roof. The door to the flat roof could not be closed, so we tied it with a rope and left by the back door. The key was taken and labelled. Rachel Godfried stayed only a few weeks in Westerbork. On 26 October she was transported to Auschwitz, where she was murdered on 29 October. 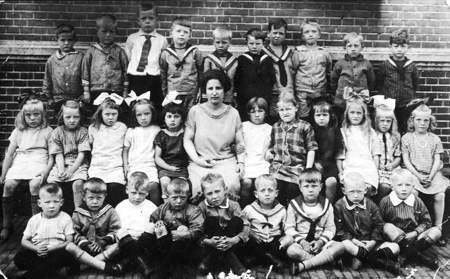 Teacher Godfried amidst the children of the 1st form of the Vledder school. 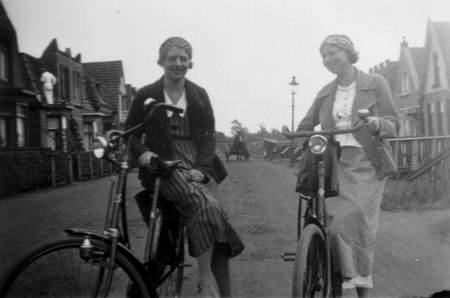 Daughters Bertha and Sientje  both had left Meppel a long time ago  survived the war. Bertha’s husband Aron did not survive the war: he died 27 March 1945 in Mauthausen. What about Jetje? She did not live at home anymore. 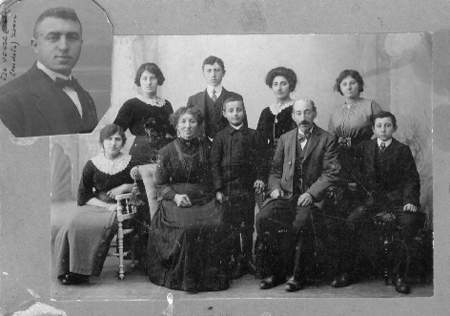 On 8 May 1935 she had moved to an institution for Jewish mentally handicapped, Het Apeldoornse Bos. On 31 December 1942 there were about 1100 male and female patients, Jetje being one of them. The nursing and domestic staff consisted of approximately 400-500 persons. On 11 January the Befehlshaber der Sicherheitspolizei und des SD, Aus der Fünten, came to the institution in civilian clothes to inspect it and asked for a situation sketch. When the Germans came the following day, Aus der Fünten asserted himself at once: ‘I have taken over the management of this institute.’ Doctors and management were locked in a room and the employees were separated from the patients. It is not possible to describe the chaos to get 1100 mentally handicapped people first into lorries and then at the station of Apeldoorn into a train. They were punched and kicked and the SS people: ‘[…] had no compassion; they did not want to understand that they were dealing with patients and acted rougher than needed. Not having enough wagons, they soon started piling them into the wagons. Jetje and many of her fellow patients left the following morning ‘destination unknown’: Auschwitz was the logical destination. Jetje died on 25 January 1943, exactly three days after she had left Apeldoorn.